The name derives from the word Syrinx, greek for a tube-formed object and the Myelum, referring to the spinal cord. Representing at least 50% of all cases, this is the most common type of syringomyelia. Obstruction of CSF (cerebro-spinal fluid) circulation from the basal posterior fossa to the caudal space may cause syringomyelia of this type. 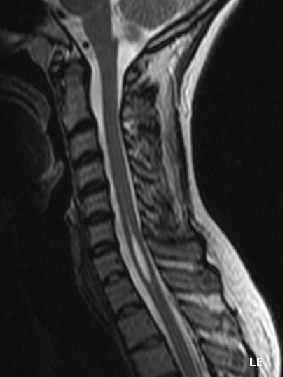 The most common example is Arnold-Chiari malformation, which is also associated with communicating syringomyelia. Approximately 10% of syringomyelia cases are of this type. The communication is visible on MRI. In some cases a blockage of CSF circulation occurs: a shunt operation may be the best therapeutic option for these patients. Idiopathic syringomyelia has an unknown cause and cannot be classified under any of the previous categories. Surgical decompression can help in some patients with remarkable neurologic deficit. There is no exact location where the Syrinx may occur. The most common location is the upper cervical spine. Since a picture says more than a thousand words, here is a schematic representation of an upper chiari deformation in both sagittal and intersectional view. We can observe how the Syrinx causes stress on the spinal cord and damages it on a long term. Syringomyelia has a prevalence of approximately 8.4 out of 100.000 individuals. This is a rough worldwide estimation. Lately the number of patients that remain stable grow, although an older study suggested that 20% of patients suffering from Syringomyelia died at an average age of 47. The reason for this lowering is a result of surgical interventions, better physical therapy and better treatment of complications associated with significant paresis. The disease usually appears in the third or fourth decade of life, with a mean age of onset of 30 years. Rarely, syringomyelia may develop in childhood or late adulthood. Syringomyelia occurs more frequently in men than in women. Dissociated sensory loss: Syrinx interrupts the decussating spinothalamic fibers that mediate pain and temperature sensibility, resulting in loss of these sensations, while light touch, vibration, and position senses are preserved. When the cavity enlarges to involve the posterior columns, position and vibration senses in the feet are lost; astereognosis may be noted in the hands. Pain and temperature sensation may be impaired in either or both arms, or in a shawl-like distribution across the shoulders and upper torso anteriorly and posteriorly. Dysesthetic pain, a common complaint in syringomyelia, usually involves the neck and shoulders, but may follow a radicular distribution in the arms or trunk. The discomfort, which is sometimes experienced early in the course of the disease, generally is deep and aching and can be severe. Syrinx extension into the anterior horns of the spinal cord damages motor neurons (lower motor neuron) and causes diffuse muscle atrophy that begins in the hands and progresses proximally to include the forearms and shoulder girdles. Clawhand may develop. Respiratory insufficiency, which usually is related to changes in position, may occur. Impaired bowel and bladder functions usually occur as a late manifestation. Sexual dysfunction may develop in long-standing cases. Horner syndrome may appear, reflecting damage to the sympathetic neurons in the intermediolateral cell column. Painless ulcers of the hands are frequent. Oedema and hyperhidrosis can occur due to interruption of central autonomic pathways. Neurogenic arthropathies (Charcot joints) may affect the shoulder, elbow, or wrist. Scoliosis is seen sometimes. Acute painful enlargement of the shoulder is associated with destruction of the head of the humerus.
. Also a well-executed anamnesis is one of the main diagnostic procedures in identifying this disease. Furthermore we look for symptoms as we have seen in the ‘differential diagnosis’ topic. Although it is quite a crude measure, it relies on doctor assessment and some research indicates that the scale is not very reliable, we use it until a better suited scale is created and has been tested for validity and reliability. There is no specific medical treatment for syringomyelia, but the origin of the disease can be met. For example the pressure caused by the Syrinx can be relieved by surgical intervention and thus reduce pain and stop further progression of neurological symptoms. Congenital syringomyelia may require that pieces of the cervical vertebrae in the area of the cavity be removed. The physical therapy for patients suffering from Syringomyelia differs depending on the location and impact of the disease, unless presented with an MRI, a neurological examination should clear out at which level the syrinx occurs. The goals of the treatment are to stop the spinal cord damage from getting worse using the techniques explained in the following paragraph and to maximize functioning. They may require active physical therapy, passive mobilizations, occupational therapy or even speech therapy. Maximizing functional capabilities by testing and asking the patient about daily activities and then acting upon the answers. This includes activities such as getting in and out of bed, walking, using a cane of crutches and such. Physical therapists may also refer a patient to the use of leg braces if they are deemed appropriate. Hospital Course: pain relief will be the most significant factor. Therefore it is important the patient receives a lot of bed rest and moves carefully. During the first month after surgery: when the operation is successful, the pain and neurological symptoms should improve rapidly. The patient should try to maintain a modestly active lifestyle. It is important that these patients try to avoid tasks involving heavy lifting! Walking and performing daily activities at ease is highly recommended. On the long term: an adequate follow-up is very important for these patients. If they do not deteriorate, they should try to maintain a relatively active lifestyle. Activities that cause excessive strain on the nervous system and spinal cord. Dorsal Spinal Intradural Intramedullary Epidermoid Cyst: A Rare Case Report and Review of Literature. ↑ 4.0 4.1 Al-Shatoury, Hassan A., and Franklin C. Wagner. "Syringomyelia." eMedicine. Eds. Christopher C. Luzzio, et al. 1 Feb. 2002. Medscape. 29 Dec. 2004. ↑ Feske SK, Cochrane TI. Degenerative and compressive structural disorders. In: Goetz CG, ed. Textbook of Clinical Neurology. 3rd ed. Philadelphia, PA: Saunders Elsevier; 2007:chap 29.